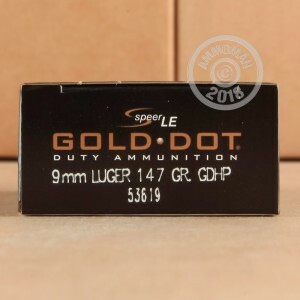 This 9mm Luger version of Speer's Gold Dot bonded-core hollow points features a heavy 147 grain hollow point bullet. The Gold Dot bullet is notable for its success in overcoming the problems of core-jacket separation that plagued early hollow points. Through a proprietary two step bonding process, Gold Dots achieve unparalleled integrity that enables them to strike an assailant intact, then penetrate and expand enough to produce incapacitation. These rounds use CCI's reliable, non-corrosive Boxer primers as well as nickel-plated brass cases. 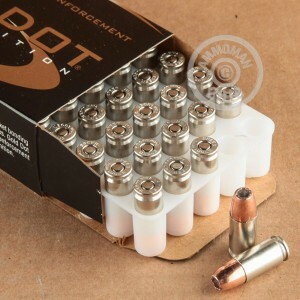 They come packaged in a case of 1,000, with 20 boxes of 50 rounds each--a great way to stock up at a volume price. As a standard pressure load, they will work great with any 9mm Parabellum pistol. AmmoMan.com promotes transparent pricing by offering free shipping for all orders over $99. That means you know exactly how much you would be paying when you look at our list prices.